Here’s the faces of romance! Al Hawaj Group has launched a Valentine’s Day campaign to help those looking for the perfect present for their loved one. The luxury retail group is giving its customers the gift of time by offering a ‘Buy 1, Get 1 Free’ promotion on all watch brands, except for Smartwatches and Swarovski time pieces. Some of the leading brands included in the sale are Guess, Gc, Charles Jourdan and Fossil and Omorfia. Terms and conditions on the promotion also apply. 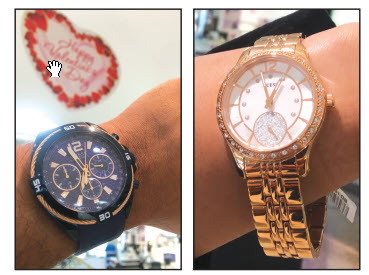 The offer, which will run until February 17, is available for shoppers at all of its 10 branches in Bahrain, as well as at Watch Time Bahrain, a watch and accessories shop which is part of the Al Hawaj Group. Al Hawaj is one of the leaders in the field of perfumery, cosmetics and fashion and also represents electronic giant Samsung.